We have an amazing prize back for you from AT&T NETGEAR who is part of our Holiday Gift Guide this year. This is a prize pack you won’t want to miss out on! We are giving away an Apple iPad Mini, AT&T Unite for Gophone and AT&T data refill cards! Take a look at the review of this great Mobile Hotspot from Blogging Mom of 4. Then come back and enter to win on the entry form below! Good luck! At NETGEAR, we turn ideas into innovative networking products that connect people, power businesses, and advance the way we live. From the most advanced wireless internet connectivity, remote home video monitoring, storage solutions, and AirCard® mobile devices, you’ll have the speed, range and performance you need, every time you need it. 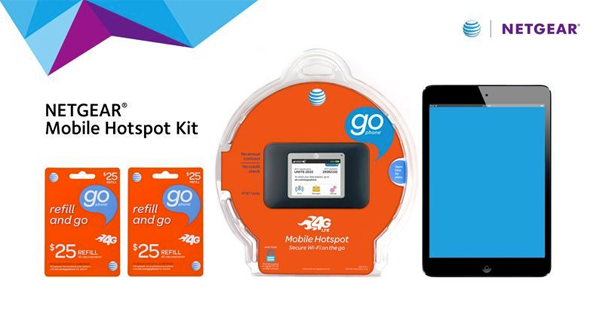 NETGEAR and AT&T are excited about the AT&T Unite for GoPhone prepaid mobile hotspot. It is secure Wi-Fi on the go that will make your life easier. Talk about great gift for the Holidays! This giveaway is open to US residents 18+. Please follow our sponsor on Twitter and Facebook. Giveaway will run Oct 28-Nov. 8. Wait for the Rafflecopter to load and enter below. I would use it while traveling(vacation) and shopping. I would use it when I am out and about, shopping or visiting relatives that do not have wifi in their homes. I use a mobile hotspot when visiting my brother who lives in the “sticks” and has a slow internet connection and a limit on data downloads. I would use it as a passanger in the car on a road trip. I would use this all the time when I’m out and about and don’t have wi-fi available! I would use it when doing errands and shopping. I live in a fairly large city and there hotspots all around. I would use a mobile hotspot when I’m out running errands, shopping, etc. My son would use it in the car while he is in the back seat on our long commute school and work. We would use one while on road trips, in the car. I would use while traveling. I wold use it at the beach with the kids. I would use it while at my son’s football practices! I would use on vacations. I would use while traveling to visit family. I would use it when we go to see my father. He lives in an area where they have cell phone service but not internet so this would be perfect. I would use it at the park or camping. Anytime I’m not at home and I’m out and about. Especially if I’m in a waiting room, or waiting for kids to get out of school, or at the park. I would use it when I’m out at with the grandchildren. I would use it in the car when we are traveling. I will use mine when I am on vacation. I would use it while shopping and on vacation. Definitely while on vacation deep in the woods at the lake. I would use it when I am not at home and want to get on the internet!! I would use it while out and about. I would use it on our next vacation to Disney. The hotel we stay at only has free WiFi the first three days. I don’t have a smart phone so it would be nice to be able to get on the web while I’m out. It will be great to check prices. My hubs would love this for when he’s hunting, camping and fishing! This would be a perfect Christmas gift for him! I would use a mobile hotspot while visiting my parents who live in a very remote area. We use them on car trips so hubby can work along the way! We geocache and many times are in areas with no wifi hotspots. This will be a big help while we are looking for geocaches. I’d use it when away from home. I would use it while I am away from home, on the road. We travel frequently so I would love the mobile hotspot to use when I am not home. I would use it at lunch at work every day! I would use this when I’m not at home and I want to use the internet. Traveling out of state with family. I’d use a mobile hotspot at coffee shops, hotels, and airports/train depots while traveling. I would use it while traveling. I would use a mobile hotspot while visiting my mom. She had very limited internet access. Thanks for the chance to win! I would use the mobile hot spot when on vacation or just when I am away from home. I would use it when I am away from home. I would use it on road trips in the van.